Since his June 18th start, when this post was originally written, Arrieta has made 15 more starts, winning 6 of them, and even with 2 rough starts in August, never saw his season ERA hit 2.90. We followed along closely in the 2nd half, and based on our scoring system, Jake Arrieta was the 40th best pitcher in fantasy baseball after the All-Star Game. Arrieta is one of 46 pitchers with 70+ IP under the belt since the break, and of those pitchers, no one has faced less batters. Only 8 other pitchers have a lower WHIP over that span and that includes Clayton Kershaw, Madison Bumgarner, Felix Hernandez, Corey Kluber, Jordan Zimmermann and Alex Cobb. That's good company. Chris Tillman and Jeff Samardzija are also on that list. Lance Lynn and Cobb were the only pitchers with 70+ IP to allow less than Arrieta's 3 HRs. And on top of his command, and ability to keep the ball in the park, Arrieta was tied with Jon Lester for 15 most strikeouts with 72 in 71.1 IP. Jake Arrieta is currently pitching in his 5th MLB season and before this season has never been successful. 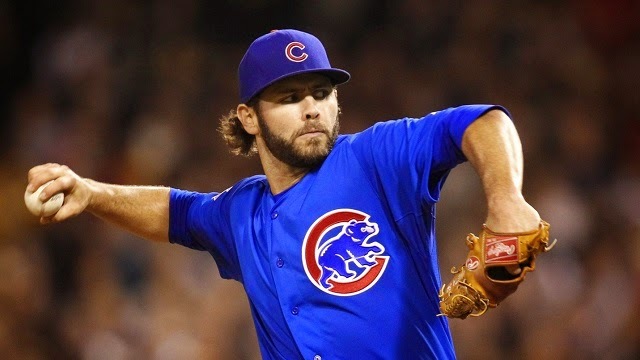 There was not much hype surrounding Arrieta coming into the league, as he was originally drafted in the 31st round by the Milwaukee Brewers in 2004 but decided to attend Texas Christian University. In 2007 Arrieta entered the draft again and was taken in the 5th round by the Baltimore Orioles. With Baltimore, the 28 year old Arrieta pitched in 69 games, making 63 starts in over a little more than 3 seasons before being traded to the Chicago Cubs. During his time with the Orioles, Arrieta was 20-25 and posted a 5.46 ERA. Like I said, not successful. Making the move to the National Leauge has been a career changer for Arrieta so far. He has made 18 starts with the Cubs and is 7-3 with a 2.83 ERA. The Cubs as usual are sitting in the basement of the NL Central but Jake Arrieta has been a bright spot for the team this year. Over his 9 starts in 2014, Arrieta is 3-1 with a 1.98 ERA and a 1.20 WHIP. Before this season Arrieta was never a legitimate strike out pitcher, as he struck out 374 batters in 409.2 innings. Arrieta has 55 strike outs in 50 innings this season. Check out his last 3 starts which has really started gaining him some attention around the league. At this point in his career, I do not think Arrieta is in the long term plans for the Cubs but he is giving the fans something to be excited about every time he takes the mound. Also he could be used as trade bait down the line, which could help bring in prospects for the future.